The Micro Coat finishes are more than just a pretty look. This is one tough finish, and a real breakthrough in a modern formulation of water reducible acrylic resin. The Micro Coat finishes are more than just a pretty look. This is one tough finish, and a real breakthrough in a modern formulation of water reducible acrylic resin. For models that get a lot of handling this is the answer. Even the Micro Coat Flat and Micro Coat Satin continue to look like new after a great deal of handling. One of the main reasons for the Micro Coat finishes is that they are the ideal way to be sure that your Microscale Decals perform up to their potential for realism. 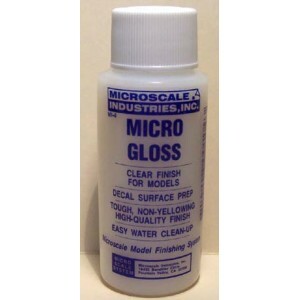 Micro Coat Clear gives you a 'wet look' shine that replicates the new synthetic paint used on the real thing. It is also the answer for a glossy base necessary for decaling. 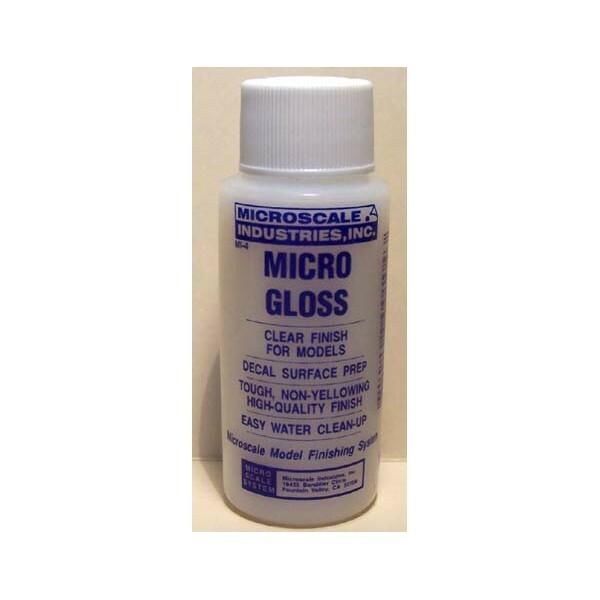 All the Micro Coat Finishes use the same water clear acrylic resin, which is tough and flexible and adheres strongly to paint and plastic. It is rated to last at least twenty years under ordinary conditions, for models this should be forever. You can mix the Micro Coat finishes if you want something in between, and they are water thinable. Though, you should go carefully on the water, it takes only a little. If your water is not completely pure, you may want to use distilled water to maintain the clearness of the finish. Iron and other metals in the water can cause a yellow tint, copper will give a green tint. For clean up before it is completely dry, ordinary warm tap water with a little detergent works great. This product is designed to be airbrushed. If you put 3 inches of water in a bucket beside you while you are spaying you can clean up instantly by removing your paint supply and running water through the air brush by operating in the bucket while immersed in water. This is quick and easy and makes no mess. It is specially handy if your are doing a lot of spraying with time in between. You can use a brush if you desire and all the thinning procedure hold true. Work like you would do for lacquer, use single strokes in one direction and feather lightly. Do not brush in or you will leave brush strokes. There are times in touch up or detail work where you must know this technique so it is a good one for everyone to learn.